I was nominated by Lauren Gunter to participate in the 7/7/7 Writing Challenge. It looks like fun, and I think you all will enjoy it! Share the next 7 sentences in a blog post. 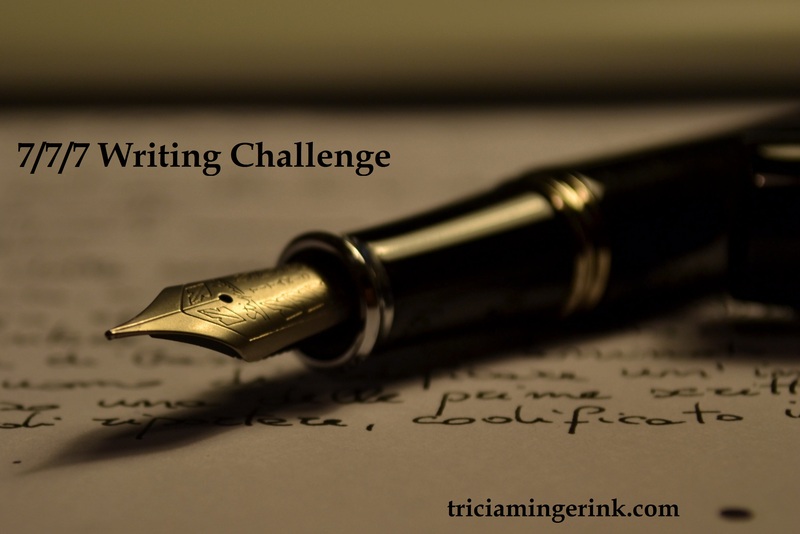 After the excerpt, tag 7 other writers to continue the challenge. I’m actually working on three works-in-progress right now. Um, yeah. Not doing too great on my whole stick to one project until I finish it resolution. In my defense, all the projects are at least in one series. That’s an improvement from where I was at a few years ago. Currently, I’m editing Deny (Book 2), writing the first draft of Book 4 (title yet to be released), and *drum roll* I started on a prequel short story that I hope to release as an ebook sometime in August (to tide you guys over until Deny releases). I’ve decided to give you guys TWO sneak peeks: a seven-line snippet of Deny and a peek at Deal, the prequel short story. Jamie stretched out, keeping his feet planted as far from Leith as possible, while he helped Leith remove the bandage. Jamie bit his lip only once, as if puzzled. Had he realized the bandage was neater than Leith would have been able to manage by himself with only one arm? Was he questioning how Leith had gotten the bandage on if he couldn’t get it off without help? Thankfully, the boy was only a trainee. He wouldn’t dare say those questions aloud, especially not to the First Blade. As they reached the final layer, Leith gritted his teeth. “No, I…” He scanned the crowd for someone—anyone—who would loan him some money. “Yes.” Worthless brat that he was. Aaahhh!!!! I’ Sooo exsited!!! Yes, I can see what is going on in the seen… & it makes me even more excited (& I have not even read Dare yet. But I will be ordering it hopefully this week… so soon;). I love books about assassins & I cannot wate to read the whole series! Thanks! I hope you enjoy the book when you get it! That’s what I’m talking about! Those are some awesome snippets!! Thanks for tagging me! It was fun to do! And ooh…!! So excited for Book 2!! And the rest of the series!! !